"On a recent mission to the Outer Colonies, I encountered one Sergeant Holly Tanaka, currently of the 412th Engineer Command… During my brief time with her, Sergeant Tanaka exhibited a mix of intelligence, grit, assertiveness, and selflessness that in my many years I've rarely encountered." Spartan Holly Tanaka (service number 93312-28001-HT) is a human soldier of the United Nations Space Command who served in the years following the Human-Covenant War. She was one of the three survivors of the 2550 glassing of her homeworld Minab known to have endured the three year struggle on its barren surface. Shortly after their rescue Tanaka would enlist in the UNSC Army, becoming a non-commissioned officer in the UNSC Army Corps of Engineers, and later volunteered for augmentation and training as a Spartan-IV supersoldier. As of August 2558 she had completed 23 military operations, including 14 full campaigns, in her combined Army and Spartan career. Holly at a young age. Holly Tanaka was born on July 9, 2530 on the human Outer Colony of Minab. She was raised with her brothers in the colony's capital city of Kynur where their mother and father managed the construction company Tanaka Exploration. "Rough times create rough men, Holly." Holly returns to the compound after a successful hunt. As the Human-Covenant War entered its final stages with the Covenant fully entrenched in the Inner Colonies, Minab stood defenseless against the ensuing genocidal onslaught. Holly's mother was at home with her brothers, washing dishes and reminiscing on a picture of her family, as Covenant destroyers rained down superheated plasma to glass their city. Holly and her father were spared from the indiscriminate Covenant attack that claimed their loved ones by being on the other side of Minab where their family business maintained a mining operation. For a year after the bombing, Holly, her father, and nine other colonists on the mining crew thrived without harassment by Covenant occupation forces and were able to gather resources in the snow-capped landscape caused by nuclear winter. 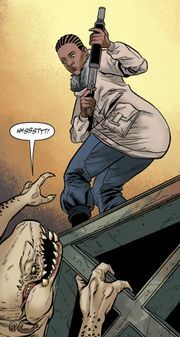 Holly became adept at hunting and setting traps for the local game, including a light brown-skinned species reminiscent of a Gúta from Reach, and was relied upon by her father as his best engineer, able to construct and maintain fusion reactors for the mine. The two of them often debated if and when they should activate a distress beacon for rescue by the United Nations Space Command yet always concluding that anyone could pick up on it, such as the Kig-Yar scavengers roaming the surface of Minab. Holly defending the mine from Ibie'shan attackers with her shotgun. Some time before Holly went out on a hunt, one of the crew members, a disturbed, aggressively violent man, had attacked and maimed another survivor blinding him in his left eye. The assailant was later subdued and tied down by the other crew who would continually argue about what they would do with this threat to their well-being. Some advocated for his immediate execution while others called for him to be kept and cared for under more hospitable conditions. In the morning after one of these disputes, unknown to his captors, the assailant became unrestrained and escaped into the night to the surrounding wilderness. After discovering that he was gone, the other survivors argued yet again, brandishing a variety of long guns to intimidate each other. Holly fired her shotgun into the air to take control of the volatile situation. Her father volunteered himself to sweep the mine for the assailant and ordered that no further action would be taken if he was not found in an effort to end the hostility that was plaguing the group of survivors. Holly questioned her father hours later about two of the people who continued to incite strife between the survivors, learning that the two of them were very private individuals that kept to themselves with attitudes typical of those living on the fringes of the Outer Colonies. Just then a call came through the radio to Holly's father from the mine's sentry that she had spotted the assailant amongst a group of at least thirteen Ibie'shan and two Ruuhtian Kig-Yar equipped with small arms with two Type-26 Wraith tanks and a Type-44 Phantom dropship supporting them. The survivors began to mount a defense against the Covenant, blocking off the large gate with a haul truck, when Kig-Yar blew through their impromptu barriers and assaulted the cavern in every direction. Holly stood on a large walkway with her father as a number of the Covenant attackers began climbing onto the structure to attack them. Holly's father ordered her daughter to retreat up to the upper levels of the facility to escape the attackers and she obeyed without question. As the ravenous aliens pressed their attack, Holly held them off for a short while with her shotgun, killing at least one of them, and destroyed a ladder to prevent them from following. High atop a ledge she witnessed her father being captured by two Kig-Yar on one of the mine's other haul truck. Distracted by this sight, the two men she had inquired about just moments before snuck up and kidnapped her in the midst of the Covenant assault. The next three days Holly and her kidnappers spent hiding in a cave in the highlands. There they revealed to her that they were colonial insurgents and that her father was the one who freed the assailant. In order to survive, they decided to acquire some gear they stocked not far from the cave; to do so, they had to pass through the Kig-Yar lurking around the compound. The used guerrilla tactics to deal with the Jackals, then stole their weapons and used plasma grenade to create a diversion. It brought the attention of the rest of the Jackals and gave them the opportunity to slip by unnoticed and retrieve their gear. Once back in the cave they decided to head south to locate any other camps of survivors. However, Holly protested violently, desiring to go find any survivors in the compound. In response, one of the insurgents disarmed Holly, claiming there were no survivors. They suggested her to join them, otherwise they would resolve to kill her in order to protect themselves from her futile attempts of "chasing ghosts". With no options left Holly agreed. The next few months they spent wandering on the surface of glassed Minab. "May not mean much to the UNSC to head out on a mission like this. But if someone's alive down there, it'll mean everything to them." Tanaka and two ODSTs on Cleyell. Recovery teams would rescue Holly and two other survivors from Minab in 2553, two years after the Covenant assault on their mining operation. Holly Tanaka would come to enlist in the service of the UNSC Army some time soon after her repatriation. In 2555 she participated in a joint-service exercise, codenamed Operation: FOCUS LENS 2555, on Mars simulating a second invasion of the Sol system by the Covenant. By 2556 she had become a non-commissioned officer at the rank of Sergeant. Her technical skills that had proved so useful in the aftermath of her homeworld's glassing would see her assigned to the 412th Engineer Command of the UNSC Army Corps of Engineers. Remnant factions of the former Covenant waged war with humanity even in the years following the Treaty of 2552. Many of these genocidal factions continued to follow Covenant wartime doctrine of glassing conquered human worlds. One such colony, Cleyell, was attacked in 2556 by a remnant faction which glassed the planet in an artistic fashion, burning a myriad of glyphs on its surface. UNSC forces that arrived on-scene determined that a single city on Cleyell's surface remained intact despite the furious plasma bombardment of the colony. 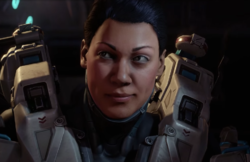 Then a sergeant in the Army, Holly Tanaka was brought aboard UNSC Cascadia, one ship to arrive in orbit shortly after Cleyell's glassing, to lend her expertise in recovering any survivors on the imperiled colony below. Sergeant Tanaka was ordered by the Navy to conduct a search and rescue mission down to Cleyell with a detachment of two Orbital Drop Shock Troopers. The mission was a success, with Tanaka discovering a group of survivors in a Kig-Yar-occupied cave system. After the survivors were rescued, Captain French of the Cascadia, impressed by Tanaka's intelligence, initiative and selflessness, recommended her for recruitment by the Spartans. In early 2557, she accepted an offer into the branch and volunteered for augmentation with the SPARTAN-IV program. 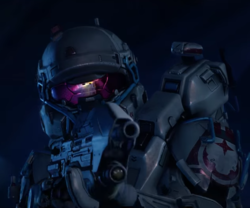 Spartan Tanaka was assigned to UNSC Infinity by February of 2558. Her first deployment as a Spartan was as part of Fireteam Domino during the month-long military operation on the Forerunner shield world Requiem. Early in the campaign, Domino partook in joint military operations alongside Fireteams Majestic, Crimson, Ivy, and Castle, neutralizing Jul 'Mdama's Covenant forces and targeting their outposts on the planet. The first of these was Operation: LAND GRAB, a mission which saw the neutralization of Covenant positions inside Requiem from May 9th to the 10th that same year. Spartan Tanaka was deployed to Ven III as part of Operation: WHISTLE STOP in order to provide a security sweep and to clear a Kig-Yar pirate nest on the planet. When Jul 'Mdama's Covenant attacked Oban on July 16th, 2558, Tanaka provided oversight and security for the delivery and testing of Misriah Armory's Project SENIOR ICE prototype. Tanaka, Palmer, Thorne and Glassman escape their crate. 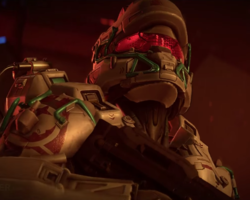 Seven months after the Requiem Campaign, Tanaka took part in Operation: ATHENA alongside Commander Sarah Palmer, Spartan Gabriel Thorne, Dr. Henry Glassman and the Sangheili ONI agent Ayit 'Sevi. The military operation was designed by Admiral Serin Osman to prevent Covenant leader Jul 'Mdama and Dr. Catherine Halsey from accessing the Forerunner facility known as the Absolute Record. Under Osman's orders, Tanaka was specifically brought on the initial infiltration team to safeguard Dr. Glassman during the mission. On September 15, Tanaka and the rest of the team were briefed on how they would infiltrate Jul 'Mdama's fleet by stowing away on-board the assault carrier Breath of Annihilation. Upon arrival at the Absolute Record, the team would separate from the fleet and use an advanced telemetry probe to transmit their location back to the UNSC for reinforcements. Two days later on September 17, Ayit 'Sevi rendezvoused with Jul's fleet in the Urs–Fied–Joori system and sneaked Tanaka and the other members inside the Breath of Annihilation. After the fleet jumped in and out of slipspace and neared the portal to the Absolute Record, multiple slipspace ruptures materialized into several ships of the fleet, one of which began to tear apart Annihilation. 'Sevi informed the team they had to abandon the ship and that their probe had been destroyed. The team was forced to flee and fight their way through a Covenant battalion in order to reach an undamaged hangar bay. When Dr. Glassman succumbed under the hazardous conditions of the ship and fainted, Tanaka carried and defended him from hostile attacks. Ayit 'Sevi soon procured a Phantom and transported everyone directly to Jul 'Mdama's flagship, Song of Retribution. With news that 'Mdama would push forward to the portal and reach the Absolute Record, the team resolved to split-up. Tanaka remained aboard the Song with Palmer and a conscious Glassman, while Thorne and 'Sevi returned to Annihilation in an attempt to use its communications to contact ONI. Tanaka fighting off Sentinels while providing cover for Palmer and Glassman. However, Tanaka and the others did not stay undiscovered for long. When the Song entered the portal and reached the Record, the custodian ancilla monitoring the facility detected the presence of Reclaimers aboard and summoned the humans from the ship, revealing their presence to the Covenant. The ancilla assembled both factions to inquire as to who was the rightful owner of the Janus Key and of the Record, but an outbreak of weapons fire from Jul's warriors caused the custodian to kill all the Elites except Jul. It then tested both parties with a hypothetical scenario to see if they could be trusted with the Record's power, but Halsey interrupted the test by hacking the ancilla, disabling it and giving herself control of the Record. As Jul called reinforcements, Tanaka and Palmer fended off attacking Covenant while protecting Glassman, but were rescued by the timely intervention of a Sentinel. It turned out to contain the backup memory of the custodian AI, who requested the humans' help in restoring its control. Tanaka and Palmer defended the Sentinel, and it reactivated its old body to overpower Halsey and take control of the Record from her. However, the Record began to fall apart after Jul ordered it fired upon to disrupt the Sentinel attacks, but Glassman aided Tanaka and Palmer in escaping by activating the local teleportation grid. They used it to teleport to the Breath of Annihilation, and were hidden there by 'Sevi until the ship returned to Sangheili space, after which the humans covertly escaped and were picked up by a UNSC prowler. Tanaka during the retrieval of Halsey. By October of 2558, Holly Tanaka had joined Spartan Fireteam Osiris, led by Jameson Locke, as the unit's engineering and electronics expert. As a founding member of the squad alongside Locke, the two were eventually joined by Spartans Edward Buck and Olympia Vale. After several human colonies were unexpectedly attacked by mysterious Forerunner entities, Doctor Catherine Halsey contacted UNSC Infinity with information about the attacks. In response, Tanaka and the rest of Fireteam Osiris were tasked with rescuing Dr. Halsey from the custody of Covenant Supreme Commander Jul 'Mdama on the Forerunner world of Kamchatka. After being briefed by Captain Thomas Lasky of UNSC Infinity, the Spartans were delivered to Kamchatka via D79-TC Pelican, where they discovered the Covenant engaging their former Promethean allies. Osiris exited the Pelican dropship to free fall past battling Covenant and Promethean ships, using their armor's thrusters to control their following landing. Osiris landed on a mountainside, where the Covenant and Prometheans were currently engaged in combat and the Spartans fought their way through the terrain. While Vale eliminated Covenant forces aboard a Type-57 Phantom, Tanaka and the rest of Osiris battled numerous Covenant and Promethean forces on the ground. As one of the Covenant blockade runners crashed into a nearby mountain peak, Osiris regrouped and was forced to outrun the ensuring avalanche. The Spartans leaped off a cliff and slide down the mountainside, where they promptly engaged nearby Covenant forces in a valley. With 'Mdama and Halsey located in a nearby Forerunner structure, Fireteam Osiris fought their way past Covenant and Promethean forces to reach their targets' location. Although 'Mdama had a Kraken deployed to fend off the hostile forces assaulting his location, the Prometheans managed to force the walker to retreat. As Osiris battled their way to the structure, they arrived at 'Mdama's and Halsey's position on a balcony. While Tanaka, Vale, and Buck engaged 'Mdama's Zealot guards, Locke charged towards 'Mdama to begin engaging the Supreme Commander in close-quarters combat. Locke assassinated 'Mdama, and Tanaka, Vale, and Buck eliminated the rest of the Sangheili on the platform. With Halsey recovered, Osiris and the doctor returned to UNSC Infinity. Edward Buck: "Why are we taking the long way down?" Holly Tanaka: "Because it's polite. Grew up on an indie colony like Meridian. Folks out here don't take kindly to the UNSC landing in the middle of town. Tend to see it as an act of aggression." Upon their return to Infinity, Fireteam Osiris learned that Spartan-IIs John-117, Kelly-087, Linda-058, and Fred-104 of Blue Team had gone absent without leave, traveling to the Outer Colony of Meridian to investigate smart AI Cortana's location. Osiris was tasked with embarking to the recently resettled and now independent Meridian to track down Blue Team and take them back to the UNSC. Fireteam Osiris arrived at the Meridian space elevator—Pinnacle Station—via Pelican, where they descended to the moon's surface. Osiris quickly discovered that Meridian was also under attack from Promethean constructs and the moon's settlers were desperately attempting to fend off the invaders. Osiris agreed to help defend Meridian's settlers from the Prometheans in exchange for the cooperation of the colony's de facto leader, Governor Sloan. After destroying numerous Promethean constructs that were assaulting the outpost at the base of Pinnacle Station, the Spartans traveled to Meridian Station, the lead settlement on the moon which the Prometheans were attempting to invade. However, Sloan was initially unwilling to give the Osiris access to the road that led to Meridian Station, fearing that the Prometheans would follow. However, the Spartans defeated the nearby Prometheans and Sloane eventually gave them access to the road in response. While on the way to the settlement, Osiris aided the settlers under attack at a nearby service garage upon Sloan's request. In exchange for their help, Sloan had his men give the Spartans one of the Liang Dortmund Corporation's M820 Scorpions to use against the Prometheans. Osiris encounters the Warden Eternal. After using the Scorpion to clear out the rest of the nearby Prometheans, Vale and the rest of Osiris proceeded to Meridian Station, where they discovered that Sloan was a smart AI suffering from rampancy. Sloan allowed the Spartans to search the settlement for clues about Blue Team's location, leading to Osiris splitting up to see if they could learn anything from the local settlers. After learning that Blue Team's prowler was seen traveling to the nearby Apogee Station, Fireteam Osiris boarded a transport Pelican and departed for the settlement. Upon arriving at Apogee, they found the settlement under attack. Working with Meridian soldiers, Buck and the other members of Osiris cleared out the Prometheans and discovered Blue Team's abandoned prowler. Accessing the prowler's data banks, Osiris discovered that Blue Team had traveled to the mines under the settlement. After eliminating more Prometheans throughout the mines, Osiris discovered that the Meridian settlers had found a massive Forerunner structure underneath the moon's surface. As they investigated the structure, they eventually came across the Warden Eternal, an ancilla that served as the protector of the Domain and claimed his loyalty belonged to Cortana. After refusing to allow the Spartans to pursue Blue Team, Fireteam Osiris engaged the Warden and eventually defeated him. Advancing forward, Osiris came across a Guardian in a large, cavernous chamber. While exploring the area, Vale discovered a local slipspace translocation network throughout the cavern and noticed Blue Team using it on above platforms. Following Vale, Buck and the rest of Osiris pursued Blue Team as they advanced from platform to platform utilizing the translocation network. During the chase, Locke got ahead of the rest of his fireteam and was teleported to the same platform that Blue Team was on. Tanaka inside the Guardian's shelter. As the Spartan-IIs prepared to travel through one last teleporter to reach the Guardian, Locke ordered them to stand down. The rest of Osiris was teleported to a higher platform, but John-117 ordered his own teammates to go through the portal ahead of him. When John refused to stand down and moved to follow his team, Locke attempted to detain him, leading to a hand-to-hand combat fight between the two while the rest of Osiris watched nearby. John eventually gained the upper hand and used Locke's own armor restraint against him. As John escaped through the portal and entered the Guardian, the massive construct began to activate and the floating platforms around Osiris began falling out of place and into the lava below. Freeing Locke, the four Spartans rushed back the way Blue Team came by traveling back to each platform via teleporter. Fireteam Osiris was just able to enter the last teleporter as its platform plummeted into the lava seconds later, and the Spartans were teleported back to Meridian's surface. Upon their return, Meridian was already well into its evacuation as settlers rushed into the moon's space elevator. As Osiris raced to the elevator to escape the ensuring damages that would be caused by the Guardian's activation, the construct rose out of the surface nearby. While en route to the elevator, the Spartans and the evacuating settlers were once again attacked by Prometheans. After eliminating the Prometheans near the base of the elevator, Sloan allowed Osiris to enter. Vale managed to have Sloan reveal that he was warned of the Guardian's activation by Cortana, and that he intended to be a part of the future Cortana was creating for humans and AI. Osiris destroyed the remaining Prometheans nearby and, after activating it, the fireteam began ascending the elevator. On the way to the elevator terminal, while engaging more Prometheans, the Guardian sent out a shockwave that heavy damaged the elevator. The Spartans were forced to climb the elevator as the structure slowly began to fall. Just as Osiris arrived at the platform their Pelican was on, the Guardian continued to send out more frequent shockwaves that slowed the Spartans down and caused the platform they were on to collapse. Osiris barely managed to enter the dropship and promptly left Meridian's atmosphere, as the Guardian entered slipspace and left the moon. "We come a long way together. A long way yet to go. Let's make a good jump, like we mean to and handle fools like we need to. And may Buck buy the first round when we get back." Tanaka in combat on Sanghelios. After Fireteam Osiris returned to Infinity, Lasky ordered for the fireteam—along with Commander Sarah Palmer and Halsey—to travel to the Sangheili homeworld of Sanghelios to utilize the planet's inactivate Guardian to pursue Blue Team. Vale and the rest of Osiris were taken to the planet's surface via Type-56 Lich, where they were tasked with finding Arbiter Thel 'Vadam while he was leading the Swords of Sanghelios against the invading remnants of 'Mdama's Covenant at the Elder Council Chamber in Nuusra. As Osiris engaged Covenant forces, Palmer had Mahkee 'Chava deploy two Mantises for the Spartans to utilize in clearing out the Covenant warriors at the Elder Council Chamber. Upon arriving at the chamber, Osiris battled the Covenant forces assaulting the building and fought their way inside, where they meet up with 'Vadam. With Osiris' help, the Swords of Sanghelios eliminated the Covenant forces at the Council Chamber. Moments later, 'Chava arrived in a Phantom and extracted the Arbiter and Spartans. Traveling to the Swords of Sanghelios' encampment at Nuusra, Osiris worked together with Halsey, Palmer, and 'Vadam to formulate a plan to utilize the Guardian. Osiris was tasked with locating a Forerunner Constructor at one of the Guardian's nearby support stations to allow Halsey to input commands into the construct to force it to activate the Guardian. Palmer flew Fireteam Osiris to the support station, but was forced to drop them off just south of the facility due to the presence of a Covenant Kraken nearby. While the Spartans provided ground support, the Swords of Sanghelios assaulted the walker from the air. While the Arbiter's flight squadrons forced the Kraken into retreat, Osiris fought their way to an ancient Sangheili temple located near the support facility. After defeating several Prometheans at the temple, the Kraken arrived at the temple, threatening Osiris' mission. As the walker neared, the Spartans boarded the Kraken and destroyed its power generator from within. Osiris fled that doomed walker and traveled into the support facility via stolen Type-54 Banshees. Once inside the station, Osiris retrieved a Constructor, but were attacked by Promethean forces. After battling their way back to an extraction point with the Constructor, a Phantom transported them back to the Swords of Sanghelios' encampment. Tanaka before the Battle of Sunaion. With the Constructor, Halsey inputted her commands into it and the construct took off to activate the Guardian. However, the Guardian was located in the Csurdon Sea next to the city of Sunaion, the last bastion of the Covenant on Sanghelios. The Arbiter's forces regrouped and prepared to attack the city to eliminate the Covenant and give Osiris a chance to board the Guardian. Traveling to Sunaion with a group of air vehicles, the Spartans, the Arbiter, and several Swords of Sanghelios forces deployed on the ground and engaged Covenant soldiers. While the Arbiter led his forces against the Covenant directly, Osiris eliminated Covenant anti-air emplacements to allow the Arbiter's fleet to move in closer to the city. Unable to receive air support for transport to the Guardian, Osiris accessed Sunaion's undercity to travel towards the construct's location. As the Constructor activated the Guardian, more Promethean forces arrived at the battle and began engaging the Arbiter and his forces. When the Guardian began rising out of the water nearby and started to activate its shockwaves, the buildings around the Spartans began to fall apart. As the Spartans moved to safety, they encountered the Arbiter engaging Promethean forces. The five battled the onslaught of Prometheans, which were soon led by the Warden Eternal, now utilizing another physical body. After a lengthy engagement, the five defeated the Warden and the nearby Prometheans just as the Guardian prepared to leave. While the Arbiter remained behind to finish eliminating Covenant and Promethean forces, Palmer and Halsey picked up Osiris in the Pelican and flew towards the Guardian. A pursuing Banshee damaged the dropship, but Palmer was able to drop Osiris off on the Guardian's surface just as it entered slipspace and left Sanghelios. Buck: "Once Chief knows the destruction Cortana's caused, what do you think he'll do?" Tanaka: "The man'll do the right thing. Always has." Tanaka and Buck, as Cortana teleports Blue Team after Osiris and the Spartan-IIs meet. Upon exiting slipspace, the Guardian arrived at the Forerunner world of Genesis, where all the other Guardians had traveled to at Cortana's demand. While the Spartans observed their new surroundings, the Guardian attempted to shake the Spartans off, forcing Vale and her team to quickly descend down the construct until they were close enough to the ground to safely jump off the Guardian. Osiris soon encountered monitor 031 Exuberant Witness, who served as caretaker of the installation. The ancilla revealed that Cortana was intending to use the Guardians to force peace across the galaxy and to wipe out those that refused, apparently trying to instill the Forerunners' Mantle of Responsibility on all species with herself and other AI—now calling themselves the Created—as its holders. Osiris resolved to aiding Blue Team and stopping Cortana, with the help of Exuberant Witness. As the Spartans traveled to Blue Team's position at Genesis' Gateway, they encountered Covenant forces that were inadvertently brought to Genesis with the Guardians, as well as hostile Promethean forces. Osiris fought their way towards the Gateway, where they were attacked by the Warden Eternal once again but managed to defeat him. Upon arriving just outside the Gateway, Osiris came under attack from more Prometheans and several of the Warden's bodies, as they attempted to buy time for Cortana to finish her plans. After a long engagement, Osiris proved victorious and Exuberant Witness gave the Spartans access to the inside of the Gateway. Osiris and Exuberant Witness freeing Blue Team. Upon entering, Osiris and Exuberant Witness encountered Blue Team. While the eight Spartans agreed to work together to stop Cortana from enacting her plans, the AI suddenly teleported Blue Team to near her position. Cortana ultimately placed Blue Team in a Cryptum with the intention of keeping them in stasis for ten thousand years while she initiated her plans. Osiris moved to free Blue Team and, upon exiting the Gateway, noticed that the Guardians were entering into slipspace to begin enforcing Cortana's new order. As the Spartans battled numerous Covenant and Promethean forces while on their way to the Cryptum, Cortana revealed that hundreds of AIs had pledged their allegiance to her, including Governor Sloan. Reaching the Cryptum, Osiris had to destroy several gravitational cores keeping the Cryptum in place. As Osiris came close to freeing Blue Team, Cortana began to taunt the Spartans in hopes of demoralizing them, but to no avail. After destroying the gravitational cores, Osiris activated a terminal to lower the Cryptum. However, Cortana suddenly pulled the Cryptum to the Guardian she was preparing to leave on. As Cortana prepared to leave, she disconnected herself from Genesis' systems, giving Exuberant Witness an opportunity to take full control of the planet once again. To aid the monitor, Osiris activated two nearby auxiliary power stations to help Exuberant Witness regain control of Genesis. The monitor provided the Spartans a passage to Cortana's Guardian and the Cryptum, and Osiris rushed to stop their departure, pushing past the Guardian's shockwaves. Locke managed to reach the relay terminal that gave Cortana control and destroyed it, reinstating full control of Genesis to Exuberant Witness. Cortana prepared to leave the planet aboard her Guardian with the Cryptum, but Exuberant Witness sent a fleet of Constructors to take the Cryptum from the Guardian just as it entered slipspace. Following Cortana’s departure, both Blue Team and Fireteam Osiris together fought their way through hordes of Promethean constructs to reach a D79-TC Pelican that had previously arrived on the planet via a Guardian’s Slipspace entry. Agreeing to return to Sanghelios, the joint team requested Witness’ help, who opened a Slipspace portal for them. After returning to the Infinity, Buck was taken by Captain Veronica Dare to reform his old squad Alpha-Nine for a covert mission that even Locke couldn't know about. When he returned, Tanaka and the other members of Fireteam Osiris met up with Buck in the Full Moon bar on the Infinity and joked around together. Tanaka was one of the witnesses to Buck's marriage to Dare alongside the rest of Fireteam Osiris and Alpha-Nine. "Holly Tanaka. Oh, Holly. How did you pass your psych eval after surviving the glassing of Minab. I'd have kept you away from sharp objects, never mind Mjolnir armor." Tanaka facing her own future reflection in MJOLNIR armor. Holly Tanaka is quiet, self-reliant, and unfazeable. Tanaka rarely socializes with her fellow Spartans and has no close friends; despite serving on Fireteam Osiris with Jameson Locke the longest, Locke still knows very little about her. Her lack of interest in socializing and inability to connect with others is a result of the trauma she experienced on Minab. Tanaka is deeply skilled with technology and is able to determine the functions and operations of most human, Covenant, and Forerunner devices with no assistance from smart AIs. Veronica Dare considered her the best at what she does. Tanaka displayed characteristics well beyond her years fostered by her close family that proved vital in her growth in the months and years following her homeworld's glassing. Only one of ten other known survivors on Minab, life proved harsh in the barren, snow-capped landscape resulting from nuclear winter, and Holly Tanaka shouldered tremendous burdens. Holly's father became a mentor to the young woman as she developed into a skilled, dependable, and loyal member of their less-than-ideal society. Quickly acquiring the necessary mindset needed to adapt to their situation, Holly Tanaka was able to provide a wide assortment of skills for her fellow survivors to thrive. In the ensuing chaos of combat against a superior foe, Holly demonstrated an impersonal attitude towards taking another life and resourcefulness in cutting off their access to other areas of their habitat. Her appearance greatly represents her ethnic background, her mother and father having been of Black and East Asian descent, respectively. Holly's eyes are very similar to her father's and her high cheekbones are reminiscent of her late mother. 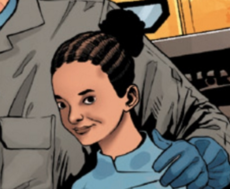 During her childhood and pre-Spartan career, Tanaka wore her hair in cornrows. While she wore it up in a bun as a child, since adolescence and going into her military career, Tanaka kept her hair short while retaining the braiding. After becoming a Spartan, she abandoned the braided hairstyle. Spartan Tanaka sports the Technician variant of the MJOLNIR GEN2 armor, with a Remembrance visor. Her preferred loadout is the M395B DMR with the M6H2 magnum. As a child Holly was seen wearing a sky blue and white garment reminiscent of a cheongsam, or qipao, a style of dress worn in China. To survive the freezing conditions of nuclear winter Holly Tanaka's daily dress was cold weather gear to include a khaki parka with a charcoal fur hood paired with navy blue ski pants, black boots, and a blue-gray scarf to protect her face and neck from the elements. In the Army she wore a solid olive drab pattern of the battle dress uniform and a coyote brown armor system. Check out our collection of quotes related to Holly Tanaka in its quotes page. 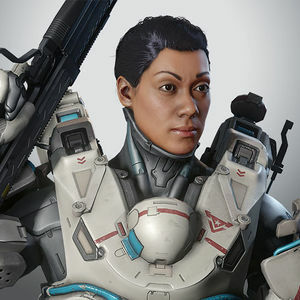 Holly Tanaka is portrayed by and modeled after actress Cynthia McWilliams in Halo 5: Guardians. 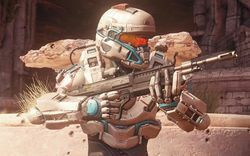 Tanaka is a playable character in Halo 5: Guardians. Her unique base attributes are the ability to have a motion sensor with smart scope, increased motion tracker range, faster thruster recharge and slower stabilizer descent. Holly Tanaka with her family as a child in Halo: Escalation. Holly is kidnapped by one of her fellow survivors during the Covenant assault. Holly Tanaka on the cover of Halo: Escalation Issue 18. Tanaka and Marines in a D79-TC Pelican. Tanaka sobbing from the loss of her father. Tanaka preparing for an ambush. Tanaka aiming her M395 DMR. Spartan Tanaka facing a swarm of Aggressor Sentinels on the cover of Halo: Escalation Issue 21. Tanaka (center background) with Locke's team in Halo 2: Anniversary. Tanaka and Locke entering Meridian's atmosphere inside a Pelican in pursuit of John-117 in The Hunt Begins. Renders of Tanaka for Halo 5: Guardians. Tanaka's Loadout for Halo 5: Guardians. Tanaka in Halo 5: Guardians. A render of Tanaka in her TECHNICIAN-class Mjolnir armor. A portrait of Spartan Tanaka. Tanaka smashing a Sangheili Zealot and a boulder on Kamchatka. An illustration of Tanaka from Halo: Tales from Slipspace. Tanaka and Locke during the Battle of Meridian in Halo Mythos.